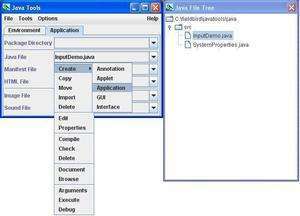 Java Tools is a lightweight IDE for creating, compiling, executing and debugging Java applications and applets. Java Tools currently includes point and click access to the Java commands, documents, directories and files. It also includes a built-in text editor and user interface for the Java debugger. Java Tools makes learning and using Java easier. Version 0.61 is a freeware program which does not have restrictions and it's free so it doesn't cost anything. For security reasons, you should also check out the Java Tools download at LO4D.com which includes virus and malware tests. Additional screenshots of this application download may be available, too. Java Tools download been highly rated by our users.